Victory can only come from the death of your opponent´s Summoner. The Summoner Wars Master Set contains 6 different complete factions to choose from. Play as the Shadow Elves and conceal your plans in swirling darkness! Choose the Benders and confound your foe, turning his own troops against him! Command the Vargath, mountainous goatfolk who call lightning from the heavens! Select the nefarious Sand Goblins and delight in malicious trickery! Muster the Deep Dwarves and control the forces of Geomancy! Lead the ferocious Swamp Orcs to war and hack upon your foes as they are snared in your vines! Everything you need to play is here. And when you order direct from Plaid Hat Games you get a free promo card. Your choice of Khan Queso, Sairook, or Khexhu. Of all the purchases that I’ve made recently, this was the one that I had the least real idea of whether or not I’d like. The idea was sound and it seemed like something that I’d like, but would it prove to be that? Anyone, because of the good word I’d heard of it, I decided to check it out – and I am extremely happy that I did. First, let me explain the game. Summoner Wars in many ways reminds me of an LCG meets miniature wargame. In Summoner Wars, players take the role of a summoner – someone who uses a special magical stone that allows them to summon armies from out of no where. The objective of the game is really simple, to kill the other players Summoner. Both players start with a pre-defined board set up based on your faction – some set ups are more offensive, others more defensive and still some a bit more balanced. Players will summon Units, play events and pretty much move around the board in their goal to kill the opponents Summoner. Why I say it reminds me of an LCG is because the packaging is set in pre-constructed decks that don’t need any additional cards, and the extra packs serve to enhance strategies with cards that are all pre-determined. It reminds me of a miniature wargame because of the combative nature and its emphasis on mobility and units attacking. From a packaging perspective, this is pretty good. Opening the box up, and its a rather large box btw, you have some damage counters, the rule book, the cards and some dice as well as two large cardboard boards. The boards are really good quality for cardboard boards, really. Inside the box, where the cards and dice are, is plenty of room for the six armies featured in the box, but also plenty of room to add more armies in the future – easy easy storage for them. The art on the cards is a minus, in my opinion. Its not bad, but its kind of an artistic/realist approach that I just don’t prefer. The unit cards are ok, but all the Event cards feature the same portrait of your faction’s Summoner – it would have been nice to have some difference in their art, I think. However, compared to the imaging I saw on my laptop – the art printed on the cards is much better. Also, the cards themselves are pretty good quality card stock. Not as strong as you’d see in, say, Magic:The Gathering, but good quality all the same. Which is funny, because I bought the Vanguard faction pack with the Master Set and the card stock for them is cheap and flimsy when compared to the Master set. From the component side, the game is pretty good. Gameplay is extremely fun and easy. I taught my wife the basic idea of the game in like about 5 minutes, and after the first game she was moving around the board with much more ease and comfort than she did with other games. She compared the game with a Chinese board game Xiangqi, which is Chinese chess, and I’d say that comparison is pretty solid. There are a lot of tactical decisions that you are making and the game can change tides pretty quickly and easily. All in all, the game is terrific and one of our favorite already. I love the simple rules, and the deep strategy involved. I am not a big fan of the artwork, but that’s perhaps my biggest complaint of the game. Who would I recommend it to? First off, people who are moving to Board Games from CCGs. Its a pretty easy jump with this one. People who are interested in trying out a miniature wargame would want to try it because the gameplay is similar, if done differently. Also anyone wanting to play a good game would want to give it a try. Who would probably not like it? If you don’t like card games, then stay away from this. The cards being moved are fine for me, but if you just don’t like them for one reason or another, then this may not be a good match for you. Also, someone who doesn’t like to make the deep, tactical decisions that come with a war-game type environment may want to avoid this one too – because it offers a lot of decision making. Lastly, while I can see a house rule set up for multi-player, the game plays better as a 2 player game no matter how you see it. So, if you like to play with a big group of people then this game may disappoint some players in your group. All in all, I’d definitely recommend this one to pretty much anybody who likes a good game. Give it a couple of tries! This game. I LOVE this game. It’s a perfect mixture of Magic’s pre constructed and constructed formats with the deep intellectual strategy of a good old fashioned game of chess. You pick one of many factions to play as(all with their own unique field setup) and you can even custom out the decks if you invest a little extra cash on your more favored factions. Then you work your way across and around the board trying to be the first player to kill the other’s summoner. There is a rich risk and reward system in playing your cards. For every card that goes into your discard pile is gone for good. so you have to really be picky about what gets used as a recourse and what hits the field. Each faction is diversely unique from the rest. Each with their own look, feel and play style. The over all rules are simple enough. If you know how to play M:tG and chess you pick up fast. For others there may be a learning curve. For both some times deciphering card text can be a hassle. But not enough to detour the thrill of the game. With plenty of extra factions to pick up along the way you will never grow tired Summoner Wars. At first I really enjoyed this game. It has nice art, a good lore, diversity of factions with very different playstyles and a good game mechanic overall (referring to the use of a board and spaces to move your cards as if a chess like game). The fatal flaw of this game is the die. It just ruins the experience. On my first games I rolled good dice, so I hadn’t noticed how much they can affect the outcome of a match. Having played more, I know now that there are times when you can’t even put up a strategy. For example, there was a game where I only rolled two results of 3 or more, which means I only managed to do 2 damage to my enemy. One of them was on a Wall and the other was on a common unit that had 2 health. My oponnent destroyed all of my units over 2 turns, leaving me only with my summoner, and got his victory in less than 5 minutes – even though I played defensive and was even able to summon more units (only to roll more bad dice). Don’t get me wrong, it is possible to have really amazing matches of Summoner Wars, where the dice are fair with both sides, but to me at least it only happens twice every 10 games. So if you want to play a strategy game where your wits count more than your luck, I would never recommend this game to you. Protect your summoner from dying by using creatures, walls and spells. Solid easy to learn and easy to teach light/medium strategy game. Has a chess-like feel to it. Each faction plays very differently and figuring out how to play each faction most effectively is a fun puzzle onto itself. However, one criticism I have is the heavy reliance on dice during attacks adds a bit more of a chance element than I would like to see in a strategy/tactics game like this. I love Warlord ccg. Summoner Wars turns out to be a lot like Warlords ccg. While some may say that the game has chess like movement mechanics, don’t let this turn you off if you don’t like chess. While Summoner Wars has the players making think ahead tactics you still have to deal with luck of the roll with 6d dice. Each player plays walls on the battlefield. The walls allow for you to summon unit cards next to the walls. The object of the game is to destroy your opponents Summoner unit. Non collectable battle card game where stratagy plays a bigger role than luck. A friend of mine introduced me and I had to get my own faction decks. Try it and see how quickly you grab some. 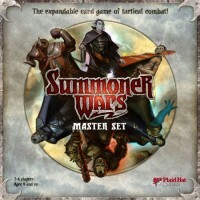 Add a Review for "Summoner Wars Master Set"